Discription: Edition of 100 hand numbered copies. 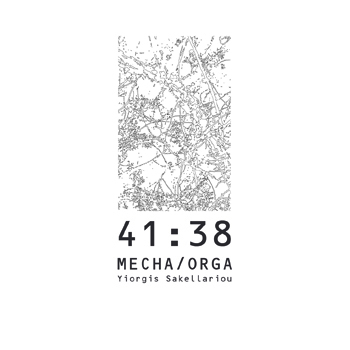 Mecha/orga is the sound project of Yiorgis Sakellariou, a Greek composer of experimental electronic music, member of the Athenian Contemporary Music Research Centre and the Hellenic Electroacoustic Music Composers Association. Active member of the Greek experimental music since 2003, Yiorgis has released musical works in labels like absurd, OtO, Monochrome Vision, Triple Bath etc. He is also the founder of Echo music, an independent Greek label since 2004 that is focusing on contemporary audio. “41:38” album based on two older compositions of 2009 and 2011, reworked in December of 2013.The two pieces are based on various field recordings from the archive of the artist, which they are used unedited or even after electronic processing. 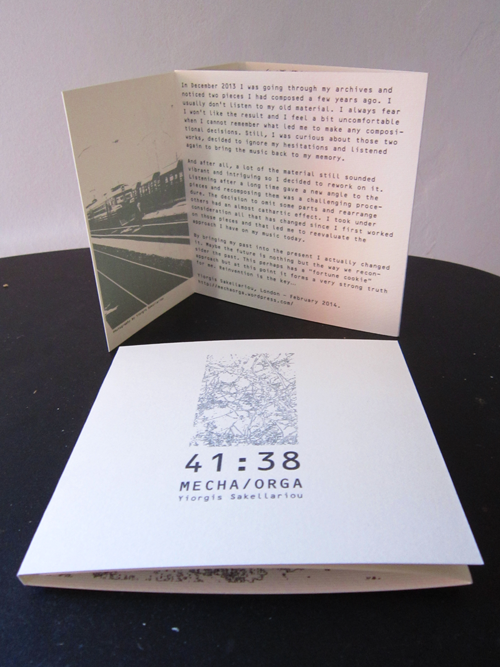 The phonographic material was mixed and edited together, creating a sound collage of environmental music. Consisting of two earlier pieces that Sakellariou exhumed and reworked. The first begins with in extremely rapid tapping, as of a hard rubber ball on a wooden surface, but far faster and more regular than humanly possible. It sounds like more than one item in action, as what begins as roughly synchronized slips in and out of rhythm, creating small wavelets of patterns; really great. The same rhythm is eventually replicated in light, metallic fashion for a little while, again to wonderful effect. The ball-like object drops out, the metal lingers then collapses into an entirely other sound-world, all dark, cavernous hums with a mysterious, misty aspect, but it returns with a vengeance a few minutes later, now supported by this subterranean rushing river. Once again, it subsides into the dark, but a more troubling one, boiling a bit. A fine track, great to hear with one's head between the speakers. The second track sounds almost as though it picks up at the other end of that underground tunnel, the liquid bubbling up into an adjacent area, building to a roar and, as before, collapsing, but this time into an urban environment, some bustling business, maybe the back room of a restaurant, boxes and such being tossed around. The scene abruptly skews and we're (I'm imagining) inside a moving truck, its contents (bottles in baskets) jouncing against one another, an odd, repeated, tonal two-note pattern permeating the air (many loops in effect here). A vast rush of sound, that pattern still dimly heard, like two distant marimba notes.More shifts, always clearly in human territory, maybe airports. Thing get a bit hazy here and, to me, don't quite cohere as well, but it's never boring, just disorienting, which might not be a bad thing. The piece returns to form with a particularly brutal, mechanical loop, really excellent, before drifting off. Yiorgis Sakellariou: field recordings, processing, etc. Unanticipated discoveries can come about as we revisit sounds that were left untasted – when not altogether forgotten – since when we handled them at first, either physically or perceptively. This is what happened to Yiorgis Sakellariou, who usually hates looking back at what he’s already heard or used. This time the infrequent choice of fishing in the archives yielded consequences which were deemed serviceable for publication; to this we heartily agree. Divided in two extended segments, 41:38 is a downreaching album of field recordings and coexisting moods juxtaposed with semiconscious exactitude. The episodic vacancy of the acoustic imagery opposes to dramatic closeups of selected “violent” emissions (for example, the clangorous braking of a train). The recognition of this contrast is presumably the necessary code to deliver the mechanism of retention from the inflexibility that would, in a way, spoil the party of reminiscence. Mecha / Orga is a principled assembler. The outstanding attributes of his work emerge all over the program, including environments detected elsewhere, perhaps in different forms and shades. The compositional aspect is approached with the right dose of discernment, particularly in regard to a functional sequencing of the events. A cadenced impulse can be followed by a ferrous efflorescence, then we’re conquered by an accumulation of remotely resonating partials that may derive from a strong air current (or a processed espresso machine, depending on the point of view). We’re not given a surplus of handles to grip at, thus avoiding the inclination to guess, classify – and ultimately degrade – the components of a process of aural coalescence better comprehended as an evocative integrity, accepting its intrinsic coherences and (mild) contradictions without extravagant speculations.